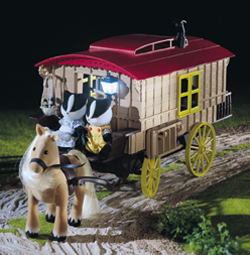 All the Sylvanians love to travel aboard the traditional pony-drawn Caravan. 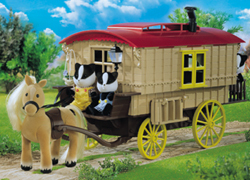 The Caravan opens out to reveal lots of exciting features, including over 50 pieces, and a real working lantern! 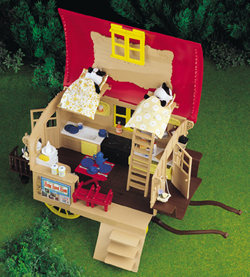 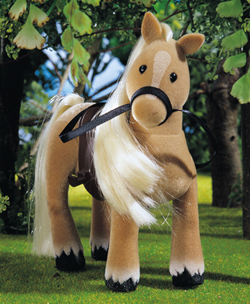 Set includes: Bramble the Pony, freewheeling caravan, two fold away bunk beds, trap door storage, detachable & adjustable ladder which can be stored neatly on the side of the Caravan, hanging flower baskets, fold away toilet & toilet accessories, bucket, brush, comb, two sleeping bags, table & chairs, pots, pans, cutlery, cups, plates, kitchen accessories and lots of goodies for the journey.